Faster Internet is the PUP that uses misleading techniques to prevent removal. Use Reimage to locate malicious components and get rid of them faster than with uninstall instructions. A full system scan blocks virus reappearance and prevents traffic to malicious domains. What are the consequences of the Faster Internet virus infiltration? How can I protect my PC from this virus? Faster Internet virus is definitely not a program you should trust to boost the speed of your Internet. It is a very intrusive adware-type program, which stealthily hijacks the computers and displays thousands of pushy ads while you casually browse the internet. The main goal of this program is to advertise the affiliate websites, increase their traffic and get payed. This process is based on the pay-per-click technique, which is relatively simple in its essence. 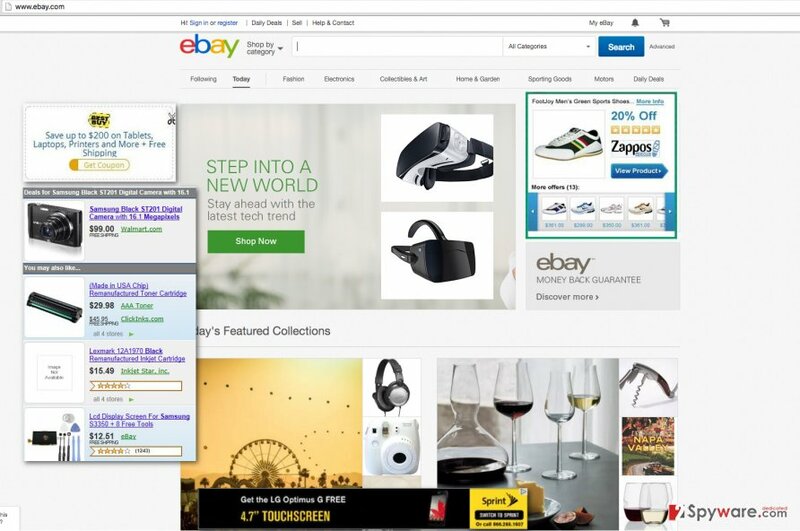 Faster Internet ads are generated in large numbers and displayed on random websites the infected computer users frequently visit. Upon interaction (intentional or unintentional) the ads redirect the users straight to the predetermined websites this adware collaborates with. In return to the increased user traffic, the adware creators are issued a corresponding payout. We do not think such shady marketing techniques should be tolerated. Besides, there are a number of other problems this program triggers on the infected computer. So why keep such a program installed? Remove Faster Internet from your computer without hesitation, because the research has shown that over time the consequences of this virus residing on the PC only get worse. To quickly and effectively get rid this potentially unwanted program, we recommend using reliable and acknowledged antivirus utilities, such as Reimage. As already mentioned above, Faster Internet redirect issue is not the only shortcoming of this program. Once it infiltrates the computer, you may start experiencing different system malfunctions: your browser may start loading really slow, become unresponsive, crash, while the overall system performance may also diminish. Moreover, unlike the majority of other adware programs, Faster Internet is especially aggressive towards your private information. It may collect data related to your hardware, including information about your hard drives, motherboard, network adapters. Also it targets non-personal information such as IP address, frequently visited websites and pages and similar data. All the collected material is sent to the remote server and stored there. Nevertheless, the most unusual and concerning fact about this program is that it may take screenshots of your desktop. So, even the most sensitive information displayed at the time of making the screenshot can be easily accessed by hackers, scammers and all sorts of other cyber criminals. If you are not sure if you have been infected yet, you should look for advertisements labeled as “Ads by Faster Internet” or “Powered by Faster Internet”. If you see such slogans, please scan your system with an antivirus tool immediately. A good antivirus software will ensure that the Faster Internet removal is secure and thorough. There are multiple methods you can employ to enhance your system’s immunity to viruses like these. First of all, as already been pointed out in this article and is also encouraged by the security specialists, you should obtain a sophisticated antivirus tool to help you differentiate between trustworthy and unreliable programs. Another way to avoid potentially unwanted programs is by installing software carefully. Keep in mind that shareware and freeware applications are usually monetized through the distribution of third-party programs, bundled in the software packages along with them. Of course, such optional installs are not disclosed to the users, so usually, they find out about the PUP’s like Faster Internet hijack post-factum. Luckily, you can easily avoid such programs by monitoring the new software installation steps via “Advanced” or “Custom” installation modes. It is recommended to use these settings even if you are sure that the source of your download is reliable because the software packages may contain applications you simply do not need on your PC. Faster Internet virus is relatively easy to get rid of. You can remove it manually – just follow the Faster Internet removal guidelines provided below this article. However, we strongly recommend not to limit yourself to the elimination of this single malware but to take care of your computer’s security in the future as well. You should instal a trustworthy anti-spyware software, which will detect and remove Faster Internet and the other hidden junk files potentially residing on your device. Just make sure you update your antivirus regularly. Also, run frequent scans of your system, to ensure that no malicious program or file is left behind. Here, look for Faster Internet or any other recently installed suspicious programs. Wait until you see Applications folder and look for Faster Internet or any other suspicious programs on it. Now right click on every of such entries and select Move to Trash. When in the new window, check Delete personal settings and select Reset again to complete Faster Internet removal. Once these steps are finished, Faster Internet should be removed from your Microsoft Edge browser. Here, select Faster Internet and other questionable plugins. Click Remove to delete these entries. Now you will see Reset Firefox to its default state message with Reset Firefox button. Click this button for several times and complete Faster Internet removal. Here, select Faster Internet and other malicious plugins and select trash icon to delete these entries. Click Reset to confirm this action and complete Faster Internet removal. Here, select Extensions and look for Faster Internet or other suspicious entries. Click on the Uninstall button to get rid each of them. Now you will see a detailed dialog window filled with reset options. All of those options are usually checked, but you can specify which of them you want to reset. Click the Reset button to complete Faster Internet removal process. This entry was posted on 2016-04-21 at 06:54 and is filed under Adware, Viruses. You can quickly scan the QR code with your mobile device and have Faster Internet virus manual removal instructions right in your pocket. How did you remove Faster Internet virus?